My two young children sleep in merino wool pyjamas, and I love sleeping in my Merino wool vest - I think it's the most comfortable night wear there is. Merino wool's comfort is quite literally a gift from nature, so I thought I'd tell you a bit more about the properties of this amazing sheep's wool. Merino wool is so soft and stretchy that it hugs you in a really gentle way - and this is because merino wool fibres can bend up to 20,000 times more and can be extended 5 times further than cotton! This makes it way more comfy to sleep in than cotton as it moves with your body and is still soft on your skin – cotton bedclothes tend to get scrunched up around you. It's fibres bend so easily they don’t scratch, preventing the itchiness traditionally associated with wool. Merino wool works in the same way as down and all wool. The small fibres allow air to be held in a pocket form, and merino wool retains the heat you create when moving for warmth and insulation. In addition, because wool is a breathable fibre, it can release this heat when needed by wicking moisture away from your skin so you don’t overheat, helping your body cope with temperature changes. If you live in an old house, these temperature changes can be extreme at night. Another amazing thing about wool is that although it has liquid repellent qualities, it can also absorb up to 35% of its own weight in liquid without feeling wet and soggy like cotton - making it perfect for dribbly teething children! It also naturally wicks moisture away from the body and breathes it out into the air, so that the skin stays drier. Merino wool is a very fine kind of wool so it does all this and more, with fibres so fine that they bend easily and so don’t scratch, preventing the itchiness traditionally associated with wool. 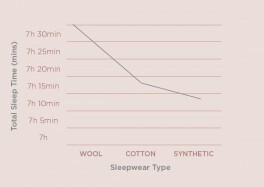 So I wasn't surprised that a new study shows Merino wool beats both polyester and cotton for sleep quality. 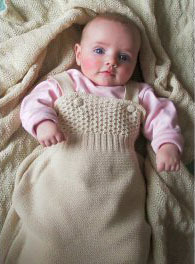 The study, by the University of Sydney in Australia, also shows that wool bed clothes help us sleep even when its hot! Participants who slept in wool bedding and clothes fell asleep quicker, slept more efficiently and slept longer than those in cotton or synthetics as you can see from the graph below. 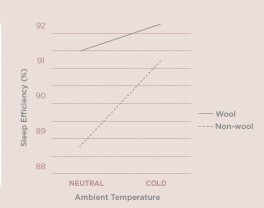 In all temperatures, sleeping in wool also results in higher “sleep efficiency” than cotton or synthetics. This is a measure of how long you’re actually asleep when you’re in bed trying to be asleep – and so takes into account how easily you fall asleep, how restful your night is and so on. It’s not really surprising, as sheep have developed fleeces that keep them warm in freezing winters but cool in scorching summers so wool is designed to work with the body and keep skin and body comfortable at all times. What is surprising is that as a culture we have been so taken away by synthetics and plant-based cotton. Now I know my family and I are all wearing a natural high-performance fabric – and yet joining ancient tribes in doing so. Ancient Britons wore finely woven wool, and Bedouins have worn wool to keep them cool in the sun and warm in chilly desert nights for centuries. In our temperate climate, wool works just as well, and now I know when I put my children in fine Merino wool pyjamas and wool sleeping bags, I’m part of a great world-wide tradition – and I’m helping them sleep. This entry was posted on Monday, February 10th, 2014 at 12:00 pm	and is filed under dressing your baby, sleeping. You can follow any responses to this entry through the RSS 2.0 feed. You can leave a response, or trackback from your own site.